For me this app is why I have a smartphone. It has a lot of features, which makes it one of the most inclusive apps out there for photography. Even just one of their modules would make up the entire functionality of others apps. You are essentially buying many apps in one since is has a plethora of functions and shortcuts. It is going to take a long time to master so do yourself a favor: sit down with it for a while read up and explore. First go to the section on learning and learn! Tapping and swiping allows you to switch dates, times, modes, and more. Getting the feel of the app without trying some critical calculation will put you in a better frame of mind. While the Macworld article is the result of poorly conducted calibration, the important takeaway is that the app can only be as accurate as the environment you run it in and the hardware you run it on. It can’t be said enough: trust but verify. Then recalibrate and try again. Bring your own GPS and compass to verify the accuracy. We are not suggesting to use the iPhone as a navigation device just an aid. Apple maps didn’t work out so well remember! We are suggesting that this can be a useful device for the visualization of photos or getting an idea of your compositions and bringing your most accurate tools to bear. If you’re fanatical about accuracy, like Steven you can also bring your compass, maps, GPS, planisphere (ref 1, 2, 3,) and sextant. Ok, the sextant was a joke but I wouldn’t be surprised if he has one. Steven is crazy about accuracy in predictions. Navigating the app is easy to get started. Start swiping and you will be unlocking all sorts of functionality. At first you will be surprised by all of the hidden things you are doing. For me the first time I opened it up I was like, Wow, what was that? What did I just do? Once you begin to get a little more advanced you will start to realize you may not be remember the proper, tap, drop, swipe, handshake combination to get where you want to go. Generally it will take some practice but let me give you some tips out to help. More content dots – The dots in the image below are a symbol that shows there is more content on this topic available just swipe in the correct place to the left or right. The next page dots are sneaky because they blend into the background. However, they can be found in the same general location so just look to see if they are there. Transition between right and left pages by swiping by paying attention to the more content dots. Previous page button – Found in the upper left. This button brings you back to the prior menu, usually. It can be helpful for getting around the app so don’t forget about it. Even when it says something strange, it usually is a “back” button – except when it is not there and is instead a “Done” button on the upper right. There are also important buttons that appear in the upper right so when you are finished look up there for some important info. Like what you ask? The save button often appears here – or at the upper right. Photo Pills back button on upper left. Changing your location or a value generally requires just a tap however in some cases it requires a tap and hold or double tap. My solution try them all. In the planner, the map will find have some icons you can tap (sometimes by accident). Or save yourself a bit of hunting by finding the Learn page and reviewing the options described there. 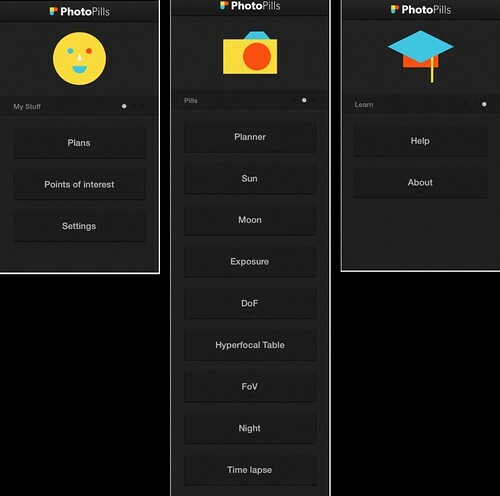 The three main menus of Photo Pills. What does every module Do? Plans – Where your Plans are saved. Points of Interest – Local points of interest. Over 10,500 all over the world! Also has a search functionality. Settings – Calculations are based in the units of measure you select, on the Camera body you select. I would suggest starting here. Imperial and Metric are the options. Planner – The Photographer’s Ephemeris (TPE)-like functionality. Is used for Sun and Moon alignment planning similar to what we cover in our Catching the Moon Webinar. Mostly used for planning, as well as scouting, but has some nice sharing functionality which will help in the organization of scouted locations on the fly. Sun – Detailed information about Sun rise, set, Time to set Azimuth Elevation, Distance, Shadow Ratio, start of different twilights (Civil Nautical Astronomical), Magic Hours (Blue, Golden), Calendar, Augmented Reality, Seasons, and Sharing (Facebook, Twitter, email, or save as an image). Moon – Detailed information about Sun rise, set, Time to set Azimuth Elevation, Distance, Shadow Ratio, start of different twilights (Civil Nautical Astronomical), Magic Hours (Blue, Golden), Calendar (Phases each day), Augmented Reality, Distance (Perigees and Apogees), and Sharing (Facebook, Twitter, email, or save as an image). Exposure – Allows you to determine equivalent exposures, that is equivalent brightness using different settings. Determine equivalent exposures by changing shutter speed, aperture, ISO. Will also help you understand how a ND (Neutral Density) filter will affect the exposure. This also calculates the change in EV value. DoF – Is a DoF (Depth of Field) calculator using your current exposure settings, (Camera, lens, aperture, distance to subject, lens set up teleconverter status), a DoF table, augmented Reality, and Sharing (Facebook, Twitter, email, or save as an image). Hyperfocal – A table which shows at a given focal length (14mm) and a given aperture value (F/1.4) what distance everything is going to appear in focus (15 ft 4in) to infinity. We talk about it a lot now you have no excuse for looking it up. FoV – Is a Field of View calculator using your current camera, lens, and distance to subject, Camera orientation (landscape or portrait) to give field of view information. You can also inverse this so you know where to stand or use Augmented Reality to see it in the phones camera. Oh and you guessed it; share (Facebook, Twitter, email, or save as an image). Also allows you to find equivalent FoV settings between cropped sensor cameras. One application Steven recently used was to determine what focal length to use to fill his field of view with Mercury, Saturn, Comet ISON and Comet Encke (136mm). Night – Includes 3 main features Night AR, Star Trails, and Spot stars. Night AR allows you to see the location of the Milky Way, the rise of the moon, and the direction stars will rotate. Aids you in the pre-visualization of how long your star trails would be. Inversely, it allows you to calculate how long it would take for the stars to form a specified arc in the sky. Finally, under Night is Spot stars which calculates the shutter speed necessary to make stars appear as spots without the aid of an equatorial mount. For an in depth article on this subject, see here. Time Lapse – Allows you to calculate data about your timelapse before you art. Information such as Event duration in real time and as a final product, FPS, total number of photos and the file storage necessary to capture the sequence on your memory card. Help – In depth help on the app, tips on the menus and how to navigate, what buttons do what. There is a lot. After a quick stop at the settings then go over here. Check it out. About– Learn about the developers, Contact the support staff, rate the app, applaude the team. The app is just so big that I am not going to be able to cover all of it in detail. There are a lot of parts of the app I want to touch on. The data – The data on every tab is amazing and detailed. You want the data on what phase the moon is in, data on when the phases are that month. The data just does not stop, it is not just the Sun or moon tab it is on FOV or DoF tabs. For a guy who does a lot of panos all of the hyper-focal, FoV info is impressive. I LOVE ALL of this data presented in a logical, clear and concise way. But, wait we want more data. Augmented reality – This is one of the most useful parts of the app. For my money this was the best tool to teach and help students visualize where the North Star is and where the Moon and Milky Way is going to rise. The overlay on the scene is the magic that allows students see where the Milky Way will be because it is super-imposed on the live picture. There is AR for everything Night, Sun, Moon, Depth Of Field… Yes, even DoF – not a preview, but an on screen indication about the range of the DoF setting. In my experience the AR has been accurate and responsive however this has not been everyone’s experience depending on your phone hardware. I am told the inaccuracy issues are due to the hardware not the software, but that is not going to stop the complaining. Can you use if for any scouting? Well that is highly debatable (Steven and I have had heated discussions about this). We would love to have more data on the photogenic parts of the Milky Way (i.e. Sagittarius, is much more deep and milky than Cassiopeia but the current depiction is rough). Location of Stars to aid in the orientation. I personally don’t care about the size of the moon. Steven would like to see the size be more realistic – it’s currently shown about 8 times its actual size. I can foresee problems with people with bad vision or people not patient enough to search for the moon (I know a lot of those, bad vision not the part about being patient). The on screen display (AR) also doesn’t show the GPS, exact angle of elevation, or exact compass direction – the data is drawn in grids that are increments of 10 degrees vertically and 12.5 degrees horizontally. But I digress, the great part about AR is that it can help you see what might be possible, when might the moon be near that object. You may still have to do the work over again because we have seen the predictions be as far off as 10 degrees if you rely on the phone hardware for compass direction. The moon is 0.5 degrees if you are running photo pills with a bad compass (bad hardware or just a bad calibration) The moon could be 20 moon diameters away in this photo (10 degrees / 0.5 degrees = 20 moon diameters). The moon would be out of this frame. Planner – It is not as good as I would have liked. My main gripe was the small screen is difficult to navigate and to pinpoint the exact point where the alignment is going to be. One thing is that there is elevation profiler which will allow you to determine what the height of the object is on the horizon. Useful yes but useless if there is a huge building in the way. It also currently doesn’t have ready access to a Topo Map so determining where there might be a hill in the way is not simple – unless, of course you are on site.. I like the share options, in the Points of interest tab you can export all of your points to a KMZ file you can open in a map editor (like Google Earth). The win for me was the portability, I always have my phone so I can just scout whenever I see something interesting so I can come back later. I can plan a shot where ever I am, unless I need the map and am not able to get a data connection, that is. If I see something interesting, I can check for an alignment right on the spot. I can figure out if it is possible then bring out the big guns for double checking. I think this is one of the biggest advantages. One thing that tripped us up… there are two AR modes in the Planner. The outer one – which is for “getting an idea” and the inner one that appears after you start a Find operation. The AR choice after selecting Find allows you to use AR to set the location of your desired target. Point the display and tap it to place the moon or sun where you want to capture it. Remember, though, that the moon or sun will be shown about 12 times larger than actual size. To close this app is the most comprehensive and inclusive of features, some planned usability enhancements will definitely kick it up a notch. What we would like to see alignment prediction tool additions. Photo Pills has so much. Now that we have seen what it is capable of we want more. Serious, understatement there because, honestly we what a whole LOT more, and that’s not to say we hate the app – not at all. It still packs more punch than everything else we’ve looked at. However, as noted, we would like to see more data in the AR and in the planner. We would like to be able to take a photo of the scene and have the all relevant data overlaid on the same photo. Further, we would like to have access to the meta-data burned into the photo. When we share a plan, it doesn’t seem to include the elevation (altitude), azimuth (compass direction) and tolerance information. We are geeks we want to write scripts to sort and map that data, and track our exploits much like Spyglass. There are a couple of little niggles in the interface that are annoying. Lines that don’t get drawn on the planner map, accidentally resetting the observer location by dragging our finger over the “set location here” icon while scrolling the map, and others. If possible, we’d like to see an “enhanced accuracy mode” so that you can be 90% confident that the AR alignment that you are shown will indeed be within 0.5 degrees. Even though of how we’d like to improve the visual interface… but hey, that doesn’t mean it doesn’t work well as is. How Accurate Is The Application? Participate and Find Out! We want to collect data from testing in many environments on many devices, not just from our own half dozen devices. Please do the following. Play with PhotoPills a bit to be sure you understand it. Go to the help menus and learn about the AR and other functions. Kill your compass app and Photo Pills (all apps preferably). This is to insure that you have a chance to calibrate. Start PhotoPills. Go to “Moon” make sure that “Info” has the current time (double tap the center of the Moon). Verify that the current date and time are correct in the upper left. If not, go back to Info and double tap the Moon or go into settings. Point the camera at the Moon. Obviously the moon must already be up in the sky for this test. You CAN try this using the sun instead, but that wouldn’t be good for your eyes or the phone unless the sun is just rising or just about to set. Once your target is in view select the “Action” button (lower right). If you have a Twitter account choose “Twitter” and send your photo to @starcircleacade be sure to include #photopillstest and your iPhone version e.g. #iphone4 or #iphone5s and your ios version e.g. #ios703. If you don’t have email available, you can save the image or post it to Facebook – just be sure to share it with us! Next turn your device 90 degrees to Landscape mode, spin yourself around a full 360 degrees (trying not to get dizzy), point the phone back at the target and repeat step 7. Super Extra Credit would be to take a photo of multiple iphones on a table all set to compass mode. Please only send two photos one in portrait, one in landscape mode per each device you have Photo Pills on. Thank you for your help! Also, please note that large metal objects (your car for example), computers, electronics and what-have-you will affect the accuracy of the compass. If you can move away from such things to do your calibration and take measurements that will help. We will publish an update to this material once we get enough data to make some calculations. This entry was posted in Gear, Maps, Photo Tip, Review, Tools, Tools and tagged App, iOS Application, moon, PhotoPills, planning, Sun on November 29, 2013 by Eric Harness. Thanks for this great feedback. I am pleased to announce that we’ve just sent a new version of PhotoPills to Apple for review. In this new version you can make the map larger, we also like having more map visible when planning our shoots. I jot down the rest of suggestions in our list of features to study. Many of them were already on this list, and we would love to implement them soon. But the big change will come with the iPad version during the 2014. 1- Azimuths displayed on the map are very accurate. We always set the azimuth using the map. 2- Once you have set the direction you want the sun/moon to be (azimuth), you need to set the elevation angle. If you are looking for rises or sets, the answer is easy: 0. 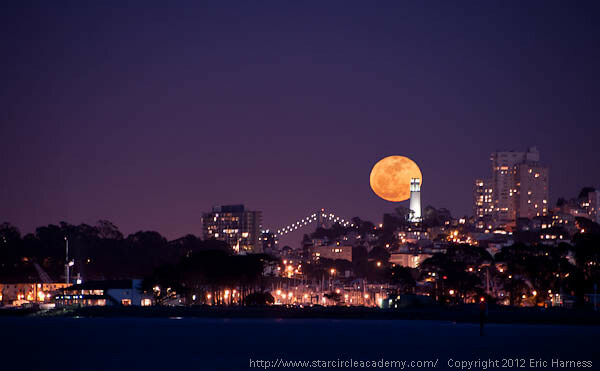 But if you are looking for, let say the moon appearing just behind a hill or over a building things get more complicated, above all for this second case. Have a look to videos 8, 9, 10 and 11 of our http://www.photopills.com/tutorials for a better explanation on how to set the elevation angle. 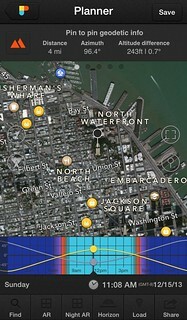 For planning sun or moon aligments, we always work with the map first and calculate the elevation how is shown in videos 10 and 11 (http://www.photopills.com/tutorials) and then check the path with the AR. The AR can be tricky, make sure you are away from any electronic device, metal object or magnetic field because they may interfere with the sensors of the device. We recommend you to wait a few seconds to let the system become stable. Quality of the information displayed in the AR view is good enough to work, but it strongly depends on the limitations of the sensors of your device (GPS, Accelerometer, Gyroscope). We’ll be looking forward to the next release. Interesting article, I’ll post my accuracy details soon. 1) On the AR page, the exposure is fixed which makes the sky extremely bright when pointing at the sun. Please enable exposure re-calculation when the screen is touched so that exposure is set to the point you touch. 3) As compass still may not be 100% correct after alignment, have the ability to enter a manual compensation adjustment for compass, ie, Photopills sun icon may be 5 degrees to the right of where the sun really is, so have ability to manually move Sun icon to compensate for iPhone hardware inaccuracy. Tilt sensors seem to be accurate, but still have ability to add a +/- compensation. Good suggestions. Hopefully the PhotoPills people are paying attention. They seem to be motivated to improve the app. Another one of my pet peeves is the overlaying of strong color over the entire map. (Blue, orange, etc) in Planner mode. It’s meant to indicate the current sun state (night, twilight, sunset), but I find the overlaid color makes it much harder to make out details on the map. I am happy to say that you can disable the twilights overlay by using the Twilights Button. You’ll find this button on the top information bar, beside the twilight time information (civil, nautical and astronomical). Again, thanks for all suggestions! Thanks a lot for the suggestions, we’ll truly take them into account for future updates of the app. Regarding the 4th point, you currently can save any page as image and e-mail them. Just tap on the Action/Share button that’s always present as the last button of the bottom tab bar.